The E-Series 51 in. x 26 in. (E2651) Dual Massage Walk In Tub is the most affordable walk in tub featuring an easy-to-clean high gloss triple gel coat tub shell for excellent colour uniformity. Stainless steel frame with adjustable feet and has a 6.5 in. threshold for easy entry. ADA Compliant with components of 17 in. seat height, textured floor and a built-in grab bar. The E2651D dual massage tub comes standard with eighteen (18) therapeutic air massage jets; six (6) adjustable direction hydrotherapy jets, both with pneumatic on/off push controls; and features an in-line water heater (1.5W). Includes a five (5) piece roman faucet in chrome with hand held shower unit. The E2651D has soaking, air massage or dual massage options and right or left drain location. Size: 26 in. width x 51 in. length x 41 in. height. Limited Three (3) Year warranty on tub components. For more product information, please call 1.800.480.6850. Enjoy at home spa luxury with our walk-in Deluxe Dual Massage tub, perfect for those with limited mobility or in need for safe bathing. Deluxe is equipped with a slip resistant textured floor, two safety grab bars, thermostatic control valve with an anti scald function, ozone sterilization, therapeutic multi colour LED light and two 2 inch drains for fast and reliable 80 second draining, which means you won't have to wait long until you can exit the tub. 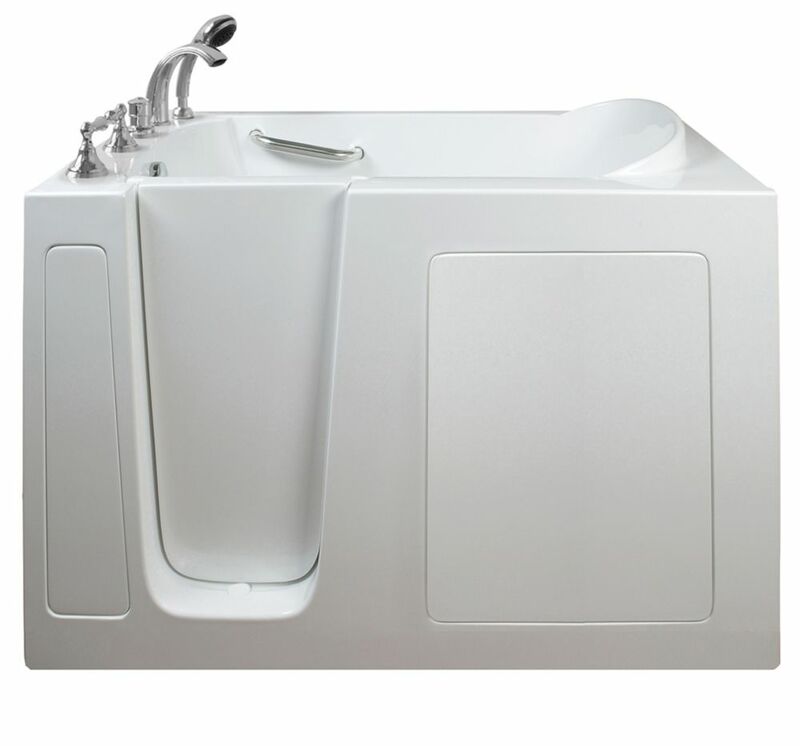 Deluxe strategically positioned 22 Air and Hydro Therapy jets, in-line water heater and flow rate control combined offers a more therapeutic bathing experience than traditional soaking baths. It helps to relieve symptoms such as arthritis, rheumatism, back pain and other common ailments. Acrylic shell will maintain its appealing high gloss white finish and is easy to clean. Elite is equipped with a slip resistant textured floor, two safety grab bars, thermostatic control valve with an anti-scald function, ozone sterilization, therapeutic multi-colour LED light and two 2 inch drains for fast and reliable 80 second draining, which means you won't have to wait long until you can exit the tub. Elite strategically positioned 24 air and hydro therapy jets, in-line water heater and flow rate control combined offers a more therapeutic bathing experience than traditional soaking baths. It helps to relieve symptoms such as arthritis, rheumatism, back pain and other common ailments. Elite has many new features compared to our Deluxe model which includes, 2" wider seat, 2 more hydro jets in the seat, a removable swivel tray, sleeker design spout and hand mixer, lower threshold and toe kick access panel. Newly designed to fit through narrow doorways and crafted to perfection, the Petite Soaking walk-in bathtub offer the same features as the Deluxe plus much more. The Petite has been upgraded to include a unique detachable swivel tray and lower threshold. A perfect solution for those in need of safer bathing, the Ella Petite comes standard with a textured slip resistant floor, safety grab bar, and Dual Drain Technology that allows the tub to be drained in as little as 80 seconds. For guaranteed exit and reliability, all of Ella walk-in baths are equipped with two 2-inch drains, two overflows and two drain openers. Ella acrylic walk-in tubs are constructed of the highest grade impermeable and easy to clean gloss finish white cast acrylic, reinforced with fibreglass and gel coat. The shell is supported with a stainless steel frame and levelling legs for durability, and easy levelling of the tub at time of installation. E-Series Dual Massage 4 Feet 3-Inch Walk-In Whirlpool Bathtub in White The E-Series 51 in. x 26 in. (E2651) Dual Massage Walk In Tub is the most affordable walk in tub featuring an easy-to-clean high gloss triple gel coat tub shell for excellent colour uniformity. Stainless steel frame with adjustable feet and has a 6.5 in. threshold for easy entry. ADA Compliant with components of 17 in. seat height, textured floor and a built-in grab bar. The E2651D dual massage tub comes standard with eighteen (18) therapeutic air massage jets; six (6) adjustable direction hydrotherapy jets, both with pneumatic on/off push controls; and features an in-line water heater (1.5W). Includes a five (5) piece roman faucet in chrome with hand held shower unit. The E2651D has soaking, air massage or dual massage options and right or left drain location. Size: 26 in. width x 51 in. length x 41 in. height. Limited Three (3) Year warranty on tub components. For more product information, please call 1.800.480.6850. E-Series Dual Massage 4 Feet 3-Inch Walk-In Whirlpool Bathtub in White is rated 5.0 out of 5 by 1. Rated 5 out of 5 by Chickky from Amazingly compact I bought an Ella walk in tub and I can’t believe how much room there is when it’s such a compact size!